Comet Goldfish look just like regular goldfish but with a much longer and more deeply forked tail fin! The Comet Goldfish is also called the Comet-tail Goldfish or Pond Comet. This fish was the first variety of single-tail goldfish to be developed with a long caudal (tail) fin. It was developed in the United States from the Common Goldfish in the early 19th century, presumably by Hugo Mullert of Philadelphia, who then introduced them in quantity into the market. Being a further development of the Common Goldfish, the Comet is sometimes confused for its close relative. The Comet Goldfish and Common Goldfish have an almost identical body shape. However, the fins on the Comet Goldfish are much longer, especially the caudal (tail) fin. Its caudal fin is also more deeply forked. On both these fish, the caudal fin is held fully erect. The adult size of the Comet Goldfish is also smaller than the Common Goldfish. Yet they are every bit as durable and can be kept in either an aquarium or outdoor pond. 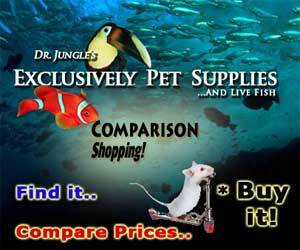 Both fish are inexpensive and readily available. The Comet is generally more reddish orange in color while the Common Goldfish is more orange. While the Comet Goldfish is typically a reddish orange, this fish is also available in yellow, orange, white, and red. They can also be found as a bi-color red/white combination, and occasionally they are available with nacreous (pearly) scales, giving them a variegated color. Other types of Comet include the Sarasa Comet. This variety has long flowing fins and is characterized by a red-and-white coloration that holds a resemblance to a koi color pattern called 'Kohaku.' Additionally, the Tancho Single-tail Comet is a silver variety with a red patch on its head. One of the hardiest of the goldfish varieties, Comet Goldfish are recommended for beginners. They are an easy fish to keep as they are not picky and will readily eat what is offered. These fish can be quite personable and are delightful to watch. They are some of the most graceful of the elongated goldfish, and this quality is emphasized by their long tails. They are active, rapid swimmers and tend to leap out of the water occasionally, so having a lid on an aquarium is good idea. They are also very social and thrive well in a community. Along with the other elongated goldfish, such as the Common Goldfish and the Shubunkin Goldfish, the Comet varieties make good pond fish. They are hardy and can tolerate cold water temperatures. They are moderate in size but are active and fast, so will get along well with Koi. Also, Comets usually won't uproot plants, but they will readily spawn. Care should be taken, so they don't quickly overpopulate your pond. Goldfish were originally developed in China. The first goldfish were normally a silver or gray color, but early in the Jin Dynasty, somewhere between the years 265 - 420, breeders noted a natural genetic mutation that produced a yellowish orange color. It became common practice to breed this pretty golden fish for ornamental garden ponds. By the 1500's goldfish were traded to Japan, to Europe in the 1600's, and to America by the 1800's. The majority of the fancy goldfish were being developed by Asian breeders. The results of this centuries-long endeavor is the wonderful goldfish colors and forms we see today. Domesticated goldfish are now distributed world-wide. The Comet Goldfish was the first variety of the single-tail goldfish to be developed with a long caudal (tail) fin. It was developed in the United States from the Common Goldfish in the early 19th century, presumably by Hugo Mullert of Philadelphia, who then introduced them in quantity into the market. The Comet Goldfish is one of more than 125 captive-bred varieties of goldfish that have been developed. The Comet Goldfish is an elongated, flat-bodied variety of goldfish. The head is wide but short, and its body tapers smoothly from its back and belly to the base of its caudal fin (tail fin). The caudal fin is long and deeply forked and generally stands fully erect. Comets have a natural life span of up to 14 years, though possibly longer if kept in optimal conditions. The Comet Goldfish is a bit smaller than the Common Goldfish, but even so, the environment it is kept in will mostly determine whether your pet grows to its full potential size. In an average 15 gallon tank, if well cared for and not crowded, they can grow up to about 4 inches (10 cm), while in a larger, uncrowded tank, they can grow larger, generally reaching about 7 or 8 inches (17.78 - 20.32 cm). If kept in a spacious pond, they can reach over 12 inches (30+ cm). They are primarily a reddish orange color, but they are also available in yellow, orange, white, and red. Some Comet Goldfish come in a bi-color red/white combination, and occasionally they are available with nacreous (pearly) scales, giving them a variegated color. Comet Goldfish can and do naturally change color, but color changes are believed to be influenced by diet and the amount of light. Aquarists often report the reds and oranges of their goldfish changing to white. A fresh diet along with good lighting and available shade are suggested as the best ways to maintain the original coloration. Even so, these measures are not always successful. Other types of Comet Goldfish include the Sarasa Comet. This variety has long flowing fins and is characterized by a red-and-white coloration that holds a resemblance to a koi color pattern called 'Kohaku.' The Tancho Single-tail Comet is a silver variety with a red patch on its head. Size of fish - inches: 4.0 inches (10.16 cm) - Comet goldfish housed in small aquariums will have stunted growth that will limit their size to four inches. In larger aquariums, they will reach about eight inches and up to twelve in a pond. Lifespan: 14 years - Comets have a natural life span of up to 14 years, though possibly longer if kept in optimal conditions. Comet Goldfish are some of the hardier species of goldfish. They are very undemanding of water quality and temperature. They can do well in a goldfish aquarium or even a pond as long as the environment is safe and their tankmates are not competitive. Many people will keep goldfish in an aquarium with no heater or filtration, but for the best success, provide them the same filtration, especially biological filtration, that other aquarium residents enjoy. Aquarium Hardiness: Very Hardy - Take care that you invest in quality stock. Although Comets can be bought very inexpensively as feeder fish, this stock will often be disease-ridden and certainly not bred for longevity. Since they are omnivorous, the Comet Goldfish will generally eat all kinds of fresh, frozen, and flake foods. To keep a good balance, give them a high quality flake food every day. To care for your goldfish, feed brine shrimp (either live or frozen), blood worms, Daphnia, or tubifex worms as a treat. It is usually better to feed freeze-dried foods as opposed to live foods to avoid parasites and bacterial infections that could be present in live foods. These goldfish are hardy and easy to keep in a well maintained tank. Minimum tank size is 15 gallons, so make sure water changes are frequent in such as small tank. Regular weekly water changes of 1/4 to 1/3 is strongly recommended to keep these fish healthy. Snails can be added as they reduce the algae in the tank, helping to keep it clean. Fifteen gallons is the absolute minimum required to house a Comet Goldfish. It's best to start with a 20 - 30 gallon tank for your first goldfish and then increase the size of the tank by 10 gallons for each additional goldfish. Providing a large amount of water per fish will help dilute the amount of waste and reduce the number of water changes needed. Goldfish are a cold water fish and will do best at temperatures between 65 - 72° F (18°- 22° C). The Comet Goldfish are one of the most hardy varieties and can tolerate temperatures a few degrees above freezing, as long as the cooling drops only a few degrees a day. A quick temperature drop can kill them, so if you live in a very cold climate, a heater is advisable. Most aquariums come with a cover that includes lighting. A cover for the tank is desirable as it reduces evaporation and though they are not prone to jumping, on occasion some gold fish will jump out. Lighting is not essential for goldfish, but does make the aquarium a nice showpiece and lighting will help if you have live plants. Minimum Tank Size: 15 gal (57 L) - Fifteen gallons is the recommended minimum to house this active fish. It has high oxygen requirements, produces a lot of waste, and will have stunted growth if it is kept in a smaller aquarium. Suitable for Nano Tank: Sometimes - A Nano tank is fine as long as it is 15 gallons or more. A larger tank will be needed for a community. Temperature: 65.0 to 72.0° F (18.3 to 22.2° C) - Goldfish can tolerate colder temperatures, but this is the optimum range for activity and longevity in Goldfish. Most fancy goldfish will thrive in both freshwater and tropical aquariums as long as there are no aggressive or territorial fish in the tank. Some good tankmates for fancy goldfish are the Chinese Blue Bitterling and the Northern Redbelly Dace. Comet Goldfish can be kept with other varieties of elongated goldfish, such as the Common Goldfish and the Shubunkin, and they also do fine with Koi. Temperament: Peaceful - Although rarely aggressive, Comet Goldfish are very active and might annoy tankmates that prefer a peaceful environment. Comet Goldfish are egg layers that spawn readily in the right conditions. They can be bred in groups as small as five individuals, but they are very social animals and likely to breed in larger groups as well. The only time Goldfish will spawn in the wild is when spring arrives. To spawn them in the aquarium, you will need to mimic the conditions found in nature. At this point, the parents will start to eat as many eggs as they can find. For this reason, it is best to remove the parents after spawning is complete. The fertilized eggs will hatch in 4 to 7 days, depending on the temperature. You can feed the newly hatched goldfish specialty fry foods until they become big enough to eat flake or brine shrimp, or you can offer the same food as you feed the parents as long as it is crushed very small. At first, the fry are a dark brown or black color in order to better hide and not be eaten by larger fish. They gain their adult color after several months and can be put in with larger fish once they reach about 1 inch long. See Breeding Freshwater Fish - Goldfish for more information on breeding Goldfish. The Comet Goldfish is inexpensive and readily available in fish stores and online. I just got 2 Comet fish 2 days ago and right now they are in a 1 gallon fish bowl. They are small right now but I know they will get bigger. What size tank should I get so that they can grow bigger? And I also want to add more fish with them. What's some good options of different fish to add? Comet goldfish grow to about 12 inches (yes, a whole FOOT long) & they require a minimum of about 40 gallons per fish in order not to stunt their growth or harm them with ammonia build up! They produce a LOT of waste!! I have a beautiful white Comet/Koi fish that I immediately removed from the tank where it was attacked by one of the other fish - possibly a Tin Foil Barb - in the tank. The Comet/Koi is recovering but I'm worried about the eyes of this fish; it seems the Tin Foil Barb bit/destroyed the eyes of the Comet/Koi fish. Can the Comet/Koi fish's eyes grow back? It's such a beautiful fish!!! I have 1 acre pond, surrounded by fir, spruce and pine. They are finished for the most part spawning. Now they are coming to the top in schools and skimming the surface. There is a lot of pollen from the trees floating On the surface. Are they eating pollen? Also, this year i have discovered a new color, grey bluegreen, they must be comets like everyone else for they have long flowing tails tipped with white. Could they be throwbacks? I have all colors and sizes, babies to 10-12', white, bi, tri and calico. I love em, but am curious. Hello! I have a large (9 inch) Comet goldfish (Vysh), and I've been feeding him small goldfish pellets his whole life. Should I be feeding him larger pellets? I'd think it'd cut back on waste and whatnot, but I thought I'd ask anyway. You should feed your goldfish medium or large cichlid pellets or frozen blood worms/brine shrimp. You should feed him a variety of thing, like humans they want different food. Frozen peas every week once or twice. Frozen Blood worms . Also your fish is very large I hope he is in a large tank. About 60 gallon tank or a pond.